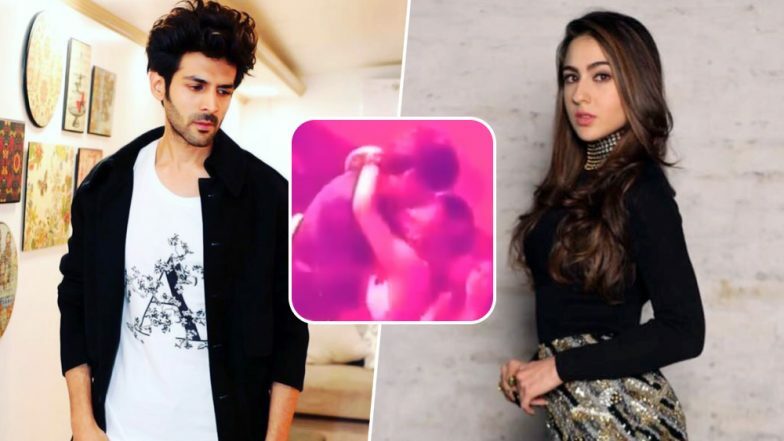 It is now old news that Kartik Aaryan and Sara Ali Khan are roped in to play the leads in Imtiaz Ali's Love Aaj Kal 2. The youngsters have even begun shooting for the film, and it looks like the director has already started them off on a very intimate note. Though, the makers may not be very happy about it, but a kissing scene from the shoot has been leaked on social media, and it is going viral within seconds. Give it to Kartik and Sara to raise the temperatures of March within a couple of days of their first venture together! Yes, It's Happening! Kartik Aaryan's 'Mass Value' Will Meet Classy Sara Ali Khan in Imtiaz Ali's Love Aaj Kal 2. So the video was shared by the fan page of Kartik Aaryan. The kissing scene seems to be a part of a song sequence being shot at a pub. The scene has Kartik and Sara slowly dancing in each other's arms, before they go for that long kiss. What's interesting is that the first Love Aaj Kal movie had Sara's father, Saif Ali Khan in the lead. That movie featured quite a few kissing scenes between him and his leading lady, Deepika Padukone. The movie, also starring Rishi Kapoor and Rahul Khanna, was one of Imtiaz's biggest hits. Saif Ali Khan Joins Sara Ali Khan & Kartik Aaryan's Love Aaj Kal Sequel - Read Details. It now looks like daughter Sara is ready to add more intensity to Imtiaz's tale of modern love, with the dishy Kartik for the company. Both the youngsters have publicly displayed mutual admiration (and crushes) for each other, and there is even a rumour going on that they are a thing.